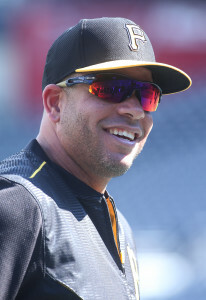 Veteran third baseman Aramis Ramirez has formally announced his retirement from baseball today, as was expected (Ramirez announced prior to the season that this year would be his final in the Majors). Ramirez told Dominican media outlet Grandes en los Deportes (Twitter links 1; 2; 3; 4; 5; 6; 7 all in Spanish) that his career will come to an end beginning in Spring Training, but he’s going to try to remain in good enough shape to take one more tour through the Dominican Winter League with los Tigres del Licey. Ramirez also said that his plan is to remain involved in baseball, but he’s not sure entirely in which capacity. He doesn’t see himself as a coach or manager but is open to the idea of doing some front office work, specifically referencing the role Moises Alou recently occupied with the Padres, serving as a special assistant to the team’s player development staff. It’s also unclear as to when Ramirez would have his sights set on that type of work, as one of the key reasons he cited behind his decision to retire was a desire to spend more time with his family after an 18-year Major League career. The 37-year-old Ramirez signed as an amateur free agent with the Pirates back in 1994 at the age of 16 and quickly earned a reputation as one of the top prospects in the game. Baseball America rated him as the No. 5 prospect in all of the minors prior to the 1998 season when he debuted with the Buccos as a 20-year-old. It took three years of back-and-forth trips between the Majors and minors for Ramirez to break out, but he did so in a huge way in 2001 when he hit .300/.350/.536 with 34 home runs as the Pirates’ everyday third baseman. From that point forth, Ramirez was a regular player in the Majors. Though he struggled quite a bitin the 2002 season that followed, he rebounded to some extent in 2003 and found himself traded, alongside Kenny Lofton, to the division-rival Cubs, where he would spend nine years of his Major League career. Ramirez was a two-time All-Star with the Cubs and received MVP votes in four of his nine seasons with Chicago. His overall batting line of .294/.356/.531 and average of 27 homers per season with the Cubs set the stage for a free-agent deal with the Brewers that would carry on through this past summer, when Milwaukee traded him back to where it all began — Pittsburgh — in exchange for minor league righty Yhonathan Barrios. All told, Ramirez will retire from the Major Leagues as a .283/.341/.492 hitter with 386 home runs, 495 doubles, 1098 runs scored and 1417 RBIs. While he was never a great defender at third base, he managed to play the position through his final season and enjoyed some nice years there, often outperforming his reputation as a sub-par defensive player. Fangraphs values Ramirez’s career at 38.3 wins above replacement, while Baseball-Reference has him at 32.1 WAR. Ramirez’s significant power and ability to handle the hot corner adequately earned him just shy of $148MM over the life of a very strong career that spanned parts of 18 years in the Majors and saw him accumulate 16 years, 111 days of Major League service time. Whatever is next for Ramirez in his post-playing days, we at MLBTR wish happiness for both him and his family. I always liked Aramis and he did some great things in a Cub uniform. I do think at times he became lazy and complacent throughout his years as a baseball player. I think had he conditioned more and played harder we might be looking at a Hall of Famer. Aramis should of won the gold glove over Wright in ’07. Thought he got robbed that year. I always enjoyed him as a Cubs fan, came up clutch a lot in those first 5 years. i remember how controversial the trade from the Pirates was at the time–they were stripping down and unloading salary, and Ramirez was already getting expensive. They traded two regulars (Lofton as well) for a spare part to get salary relief. Interesting career. Ramirez’ WAR is a typical problem regarding saber metrics: BB Reference has him a 32.1 and FanGraphics 38.3. It’s a highly-subjective system that’s open to all sorts of interpretation. A line of .318/.373/.578 is universally a superstar, but you’ll have people involved in saber metrics claim otherwise, based on an equation that’s neither relevant or logical. You can have SUBJECTIVE opinions on which different data points are more or less valuable in evaluating a player. Your failure to understand an equation does not speak to whether it is either relevant or logical. Most of the people who disregard WAR don’t get how it’s calculated. It’s not like they’re aren’t weak areas, and it’s silly to ignore everything else and just run with WAR, but it’s a very good way to compare players to each other. The more you look at what adds up to teams winning games, the more arbitrary some of the traditional stats look. You can test a new stat with the Babe Ruth test. Does WAR say that Babe Ruth was ridiculously good? Yes. Therefore, WAR has at least some merit. A .318/.373/.578 line in 2004 is a lot less superstar-like. There were eleven players that season with higher SLG – including two other third basemen having MVP-caliber seasons. He was 41st in OBP. He was 14th in AVG. If you give him the 12th best SLG, 41st best OBP, and 14th best AVG in 2015, with very negative baserunning and slightly negative defense, he’d hit .306/.356/.540 and look a good bit like David Peralta, with worse baserunning and better defense. Peralta hit .312/.371/.522 this season and posted a 3.7 WAR mark.